Your tickets are on the way! We hope you enjoy the film! Thanks to our generous friends at Madman Entertainment, we're giving our members the chance to WIN an in-season double pass to THE DEATH OF STALIN, releasing in Australian cinemas on the 29th March. We have 10 double passes up for grabs! THE DEATH OF STALIN is a bitingly sharp film featuring an outstanding ensemble cast including Steve Buscemi, Rupert Friend, Simon Russell, Jeffrey Tambor, Jason Isaacs, Olga Kurylenko and more. The one-liners fly as fast as political fortunes fall in this uproarious, wickedly irreverent satire from Armando Iannucci (Veep, In the Loop). Moscow, 1953: when tyrannical dictator Joseph Stalin drops dead, his parasitic cronies square off in a frantic power struggle to be the next Soviet leader. Among the contenders are the dweeby Georgy Malenkov (Jeffrey Tambor), the wily Nikita Khrushchev (Steve Buscemi), and the sadistic secret police chief Lavrentiy Beria (Simon Russell Beale). But as they bumble, brawl, and backstab their way to the top, just who is running the government? Combining palace intrigue with rapid-fire farce, this audacious comedy is a bitingly funny takedown of bureaucratic dysfunction performed to the hilt by a sparkling ensemble cast. To celebrate the release of THE DEATH OF STALIN in Australian cinemas on 29th of March, WeekendNotes subscribers have the chance to win an in-season double pass. 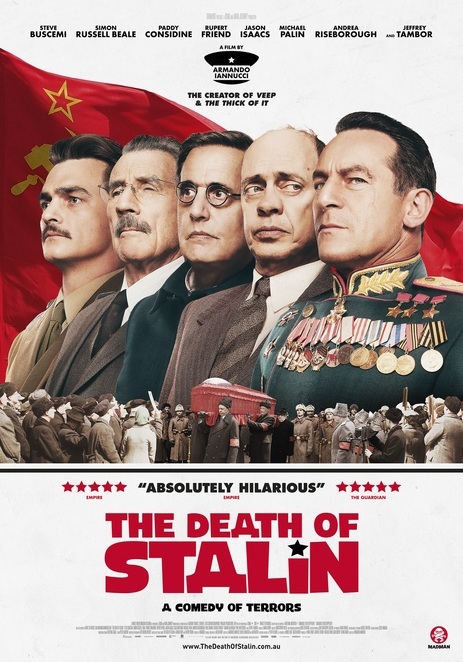 To go into the draw, all you have to do is send an email titled 'THE DEATH OF STALIN' to competitions@weekendnotes.com and let us know in 25 words or less why you want to see this anticipated comedy. Please make sure to include your full name and mailing address so we can send you your prize! For more on THE DEATH OF STALIN, check out www.madmanfilms.com.au/the-death-of-stalin - In cinemas from 29th March.